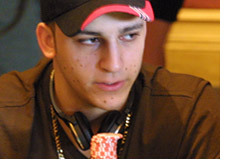 At the World Poker Tour’s stop in Paris last year the €15,000 buy-in High-Roller tournament came down to a heads-up battle between 2010 BLUFF Magazine Player of the Year Sorel Mizzi and long-time poker pro Freddy Deeb, with the veteran Deeb able to dispatch the young Canadian poker pro. At the 2011 WPT Paris High-Roller tournament the two were once again amongst the 36 entrants and history would almost repeat itself. The final hand was one you don’t see too often during heads-up play, with Deeb holding A/J and Mizzi A/A. Not only did all of the money not go in pre-flop (quite rare in itself considering A/J is a powerhouse hand heads-up) but a J-x-x flop sealed Deeb’s fate and handed the title to Mizzi. Most of the poker world will now be moving on to the Partouche Poker Tour Main Event in Cannes. This entry was posted on Tuesday, September 13th, 2011 at 9:26 am and is filed under Poker News. You can follow any responses to this entry through the RSS 2.0 feed. You can leave a response, or trackback from your own site.